Editors Note: Another great article by our resident man about town Keith Doten. He’s been out at the latest arrival to the world of Saigon Beer Clubs. Can’t wait to get back and see for myself. 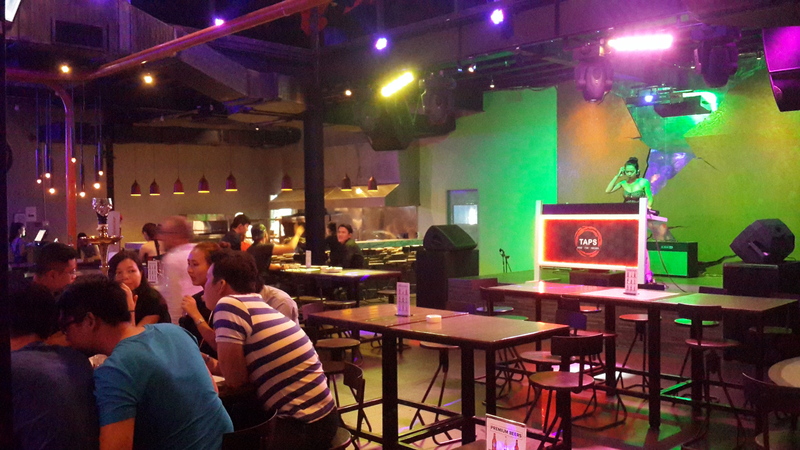 I’ve been to a good number of beer clubs in Saigon and was genuinely expecting a similar experience when I went to TAPS Beer Club last week. 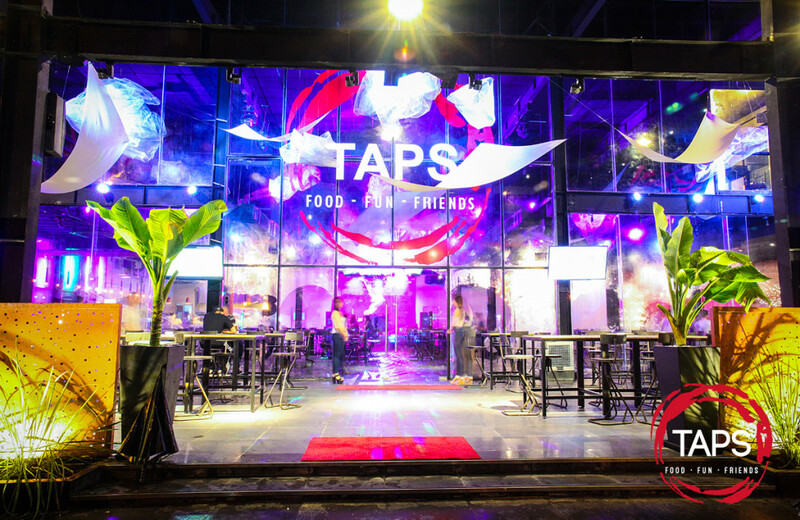 TAPS, located on Truong Dinh (147 Truong Dinh, P. 9, Q3) is a bit away from the lights of some busier parts of the city, but its location allows for a spacious footprint, and a unique experience from the ‘crowded street’ feel in other areas of Saigon. TAPS feels open – with a huge glass front, a sleek interior, and a stripped-down design. 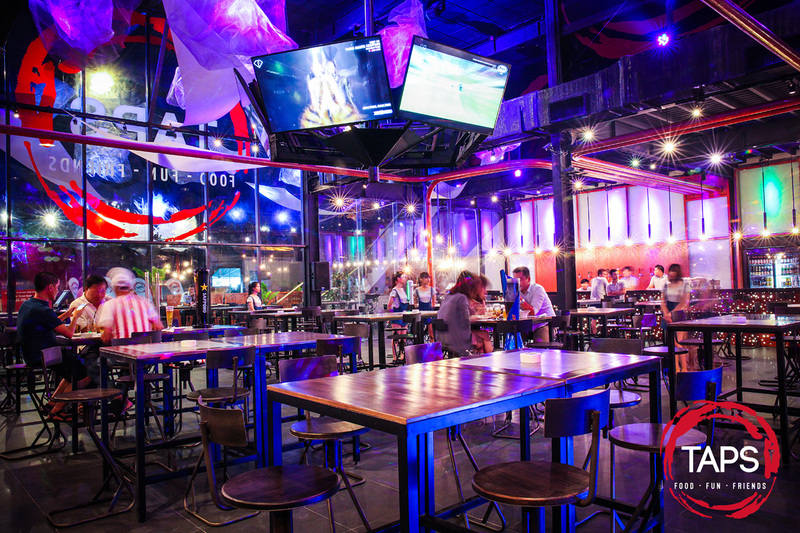 The DJ and 360 degree TVs are set in direct line to the front door, so you walk into an exciting atmosphere at the outset. Looking around the club, the spacious feel comes through. TAPS sports an open kitchen, and a simple bar with a ton of taps on the back wall – clean-looking, and minimal obstruction. Except for a few private spaces with low couches and tables that are off to the side, the whole area is in view. I quickly noticed four tables set in a square pattern around the room with their own beer taps – 1 point for innovation! According to the owner, Rafik, this is a first for beer clubs in Vietnam. These tables can be reserved for groups where you pay by the hour or by the keg. A definite upgrade on the beer tower! Plenty of space for large groups. Rafik has worked internationally in the restaurant business for a long time. During our conversation, he showed expertise, detail, and passion for ensuring a great experience for his customers. TAPS has a first-class refrigerated room for keeping the kegs (for both the bar taps and the private tables) and the off-tap beverages nice and cold, all the way to the table. Another first in Vietnam, according to Rafik – 2 points for innovation! One thing that bugs me about some beer club (And definitely high-end club) experiences in Saigon is paying 50-70k for a beer that you could get right next door for a half, or a third of the price. TAPS, in that regard, is a more affordable option. Across the board – beer, spirits, cocktails, and food – the prices were remarkably reasonable for the experience. We tried a few of the munchies – the Nước Mắm chicken wings and marinated fish on Lemongrass were fantastic! I’ll definitely be back for the Shisha as well. Rafik is originally from Egypt, so I know he’s not going to let that product quality slip. About the menu – I can’t claim to be an expert on beer club food menus in Saigon, but this one definitely seems to be throwing in some interesting options. Crocodile, Emu, and lamb dishes for instance. (3 points for innovation). The menu is broad, with classic Vietnamese eats (spring rolls, papaya salads, Lúc Lắc), other Asian dishes (Bulgogi ribs, Tom Yum, Teriyaki Pork, Seafood rice), as well as some Mediterranean/Western fare (Italian Sausage, BBQ short ribs, buffalo wings, pasta). And even a dish for my Filipino cravings, with their own Pancit Noodles. It certainly seems like there would be something to try, no matter what the desire! Unfortunately, we visited on a low night – the club was pretty empty. I get a feeling like the other nights are much busier, and that they definitely will be once knowledge about the place spreads around. I often leave clubs and beer clubs feeling like I had a great time, but that it was overpriced. No such feeling at this beer club – a great time and great value! I’ll be back for sure to try out the Tap Tables and the Hookah. You should do the same! A former Project Manager from Saint Paul, Minnesota, Keith lived in the Philippines for several years before moving to Ho Chi Minh City. 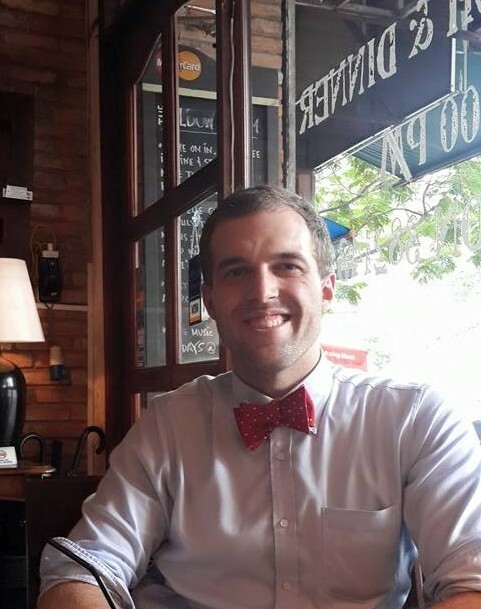 He currently teaches English to students of all ages for a number of organisations. In his spare time, Keith is out and about, actively exploring all the amazing things Ho Chi Minh City and Vietnam have on offer. His favorite quote is “Happy is the Man who is grateful.” and applies this to the way he approaches life.